Honeybee larvae develop into queen bees only when they are fed large quantities of a food known as royal jelly. 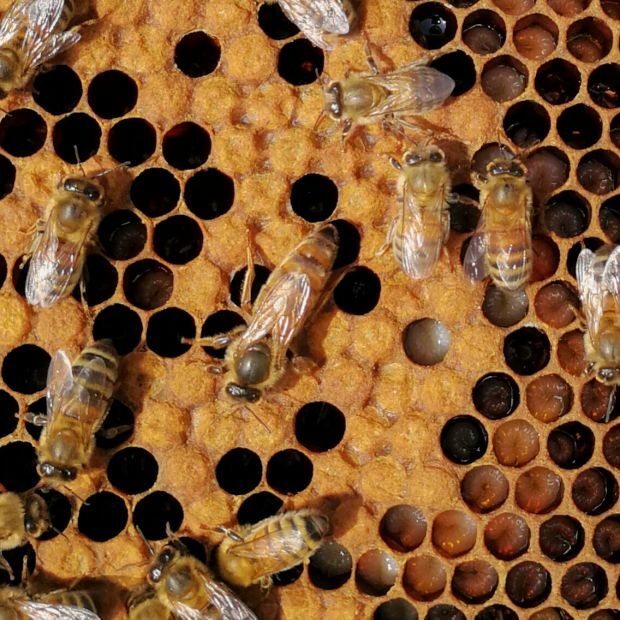 But royal jelly does more than determine whether a larva becomes a queen: it also keeps her safely anchored to the roof of the structure, called a queen cell, in which she develops. Research published in Current Biology explains the role that the pH of royal jelly plays in making the substance viscous enough to keep the queen-to-be from falling. "And then we realized that the protein that we were purifying at pH 4 was somehow much bigger in size than what we would expect from its amino acid sequence. Most purification protocols use pH 7, so other people never expected or saw the huge size of the protein," she says. She found that the main protein in royal jelly, MRJP1, polymerized with another protein in more acidic conditions to form a network of fibres. These fibres both increased the size of the protein and played a crucial role in changing the jelly's viscosity. "That was, in the end, the missing link between the pH, the viscosity change, and the protein," she says. It's still unclear how these fibres change the viscosity of royal jelly. But she does have a good hypothesis for why the change is necessary: royal jelly is produced in the glands of worker bees and needs to be fluid enough to travel through their glandular ducts. Production of the jelly actually happens in two separate glands, one that produces the proteins in a neutral pH and one that produces fatty acids that can reduce said pH when the two secretions finally meet. Other species have similar pH mechanisms that regulate the formation of crucial proteins. In humans, a protein that serves as scaffold for melanin synthesis only forms fibres at pH 6 in specific organelles. Another example is spider silk. "You don't want it to be too sticky in the gland where it's being produced, but when the silk is coming out, there changes in pH that contribute to turning it into the real, strong silk," she explains. So royal jelly's pH-dependent viscosity change does make a lot of sense—it's just that no one had ever looked at it before.